You don't have to worry about a thing on this all-inclusive private dune buggy tour of Cozumel! Enjoy flexibility as you customize your itinerary with your private guide, visiting the sites that you want to visit. You can drive the buggy yourself, or relax as your private guide takes the wheel. Lunch, refreshments, beach club access, entrance fees, snorkeling gear and round-trip transportation all included! This all-inclusive dune buggy tour is completely customizable based off what you want to see when in Cozumel. Meet your private guide at your hotel or cruise ship port and embark on your 5-6 hour private tour of the island. Everyone can take turns driving, and if you're tired, just ask your guide to take over! While there is no set itinerary, there are some attractions you probably don't want to miss! Punta Sur Ecological Park: one of Cozumel's main attractions and located on the southern tip of the island, Punta Sur is a spectacular ecological reserve. 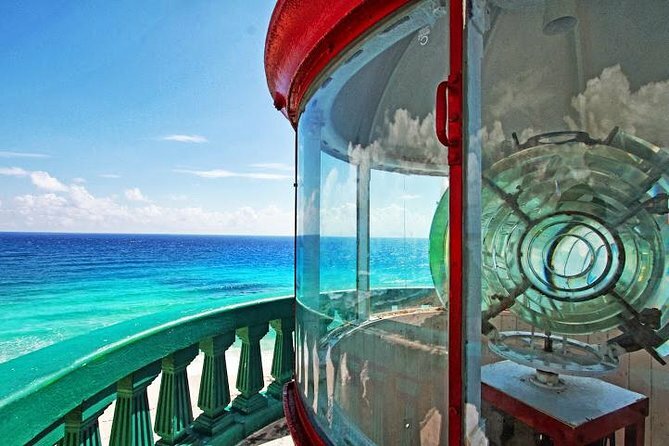 Enjoy panoramic views from atop the lighthouse and visit the small nautical museum. Then head over to the mangroves and lagoons, enjoying spectacular views of nature and looking out for crocodiles. You can also visit the small Mayan ruins located at Punta Sur. Admission to the park is included in the tour price. East side: drive along 7 miles of secluded oceanfront, boasting magnificent white-sand beaches, blow holes, mesmerizing rock formations, caves, secret beaches and off-road paths. Your guide will take you to explore secluded beaches (not those overcrowded ones on the other side of the island) and hidden caves that many tourists never visit. Beach, lunch and snorkel: when you feel like relaxing, just head to one of Cozumel's best beaches (your guide can help you with that!). Take a dip in the crystal-clear waters or try snorkeling (gear included) amongst colorful reefs and tropical fish. Having built up an appetite, indulge in a traditional Mexican lunch of your choice. You can suggest what you'd like to eat and the guide will be able to cater to your needs (vegetarian option also available). Afterwards, you can learn about tequila and try some refreshing margaritas before heading back to your hotel or the cruise ship.